Party time after a long day on the road. Rudi and Gaby, riders that I had met two years earlier at a hotel in Corteno Golgi, talked me into meeting them and other riders from their area in Serfaus. Sometimes we all rode together, and other times we all split up to do our own thing. 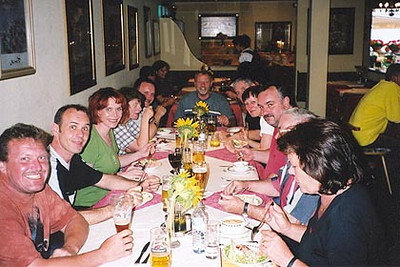 Seated left to right: Rolf, Rudi, Gaby, Sabine, Rudiger, Rheinhold (at the end), Hans, Traudi, Fred, Albrecht and Margot.